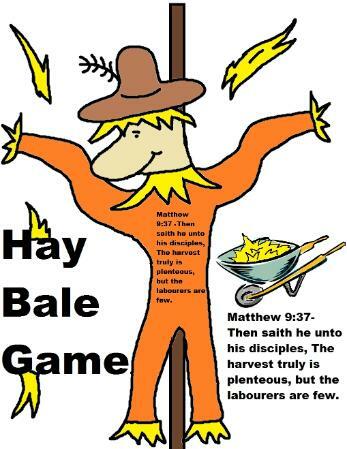 "Booth Ideas & Bulletin Board Ideas"
Use this scripture scarecrow for your poster board or bulletin board to decorate. Use these hay bales to put on your poster board or bulletin board. Print and laminate if you want. Tape this to the side of the wheelbarrow and fill it with hay. Set a timer and let the kids dig to pick 1 prize out. Give them like 5 seconds to dig. You can print this out and laminate and hang up on the door. 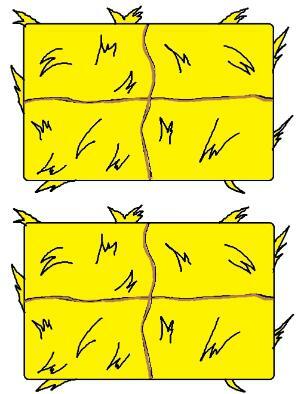 You can make a poster board sign that looks like this if you print the templates of the scarecrow and hay bales out. This is just a picture to show you what it will look like. Buy some small hay bales and lay around the room. Or if you know someone that bales hay then see if you can borrow some from them and just return them once the Fall Festival is over. 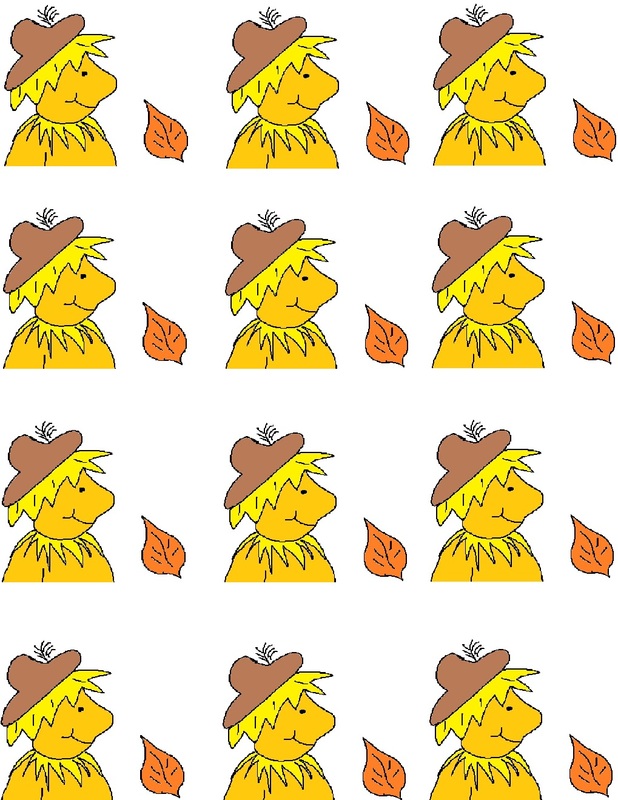 If you have tables then you could cover them with fall scarecrow tablecloths. You could also use other Fall Themed tablecloths that have pictures of Corn, Leaves, Hay Bales, Fall Trees, Autumn Colors, etc, on them. Hang Hay Bales or Scarecrow Ceiling Hangers from the ceiling. 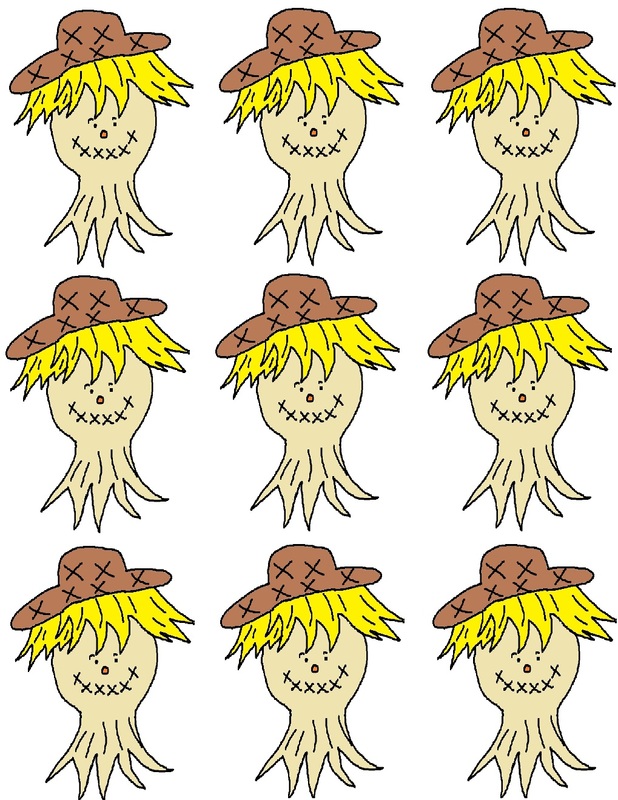 You can always make your own by printing out pictures of hay bales and scarecrows and laminate them. Punch a hole in the top of the picture and run some brown yarn through it. Then hang it from the ceiling using a paper clip or tape just depending on what kind of ceiling you have. Add a decorative sign to your door using poster board. Just put a picture of our scarecrow in the middle that has a scripture across him and add these two hay bales on each side of the scarecrow. Take some straw from the hay bale and tape little chunks here and there all over the poster board. If you don't want to use hay then tape some real leaves or fake leaves all over the poster board. 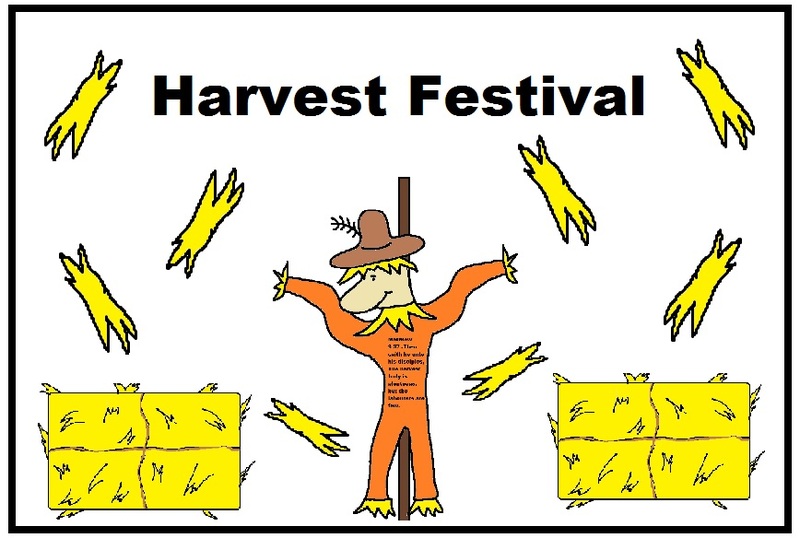 Write the words "Harvest Festival" across the top of the poster board with a black sharpie maker. Or type them out in Paint Program and print them out and tape to poster board. Set up an area to take the children's pictures. Add some pumpkins and fall flowers to the background. Have the hay bales in the photo too. You can take pictures individually or you can take one single picture of all the kids. 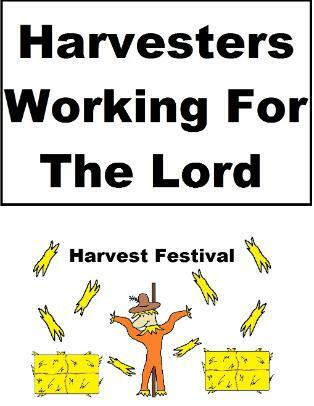 You can also print the Harvesters working for the Lord picture out and hang it up on the door. Just laminate it and hang it up. It is an 8.5 X 11 picture. Hay Bale Booth: Set up a wheel barrow in the room and tape our sign to the side of the wheel barrow that say's "Hay Bale Game". 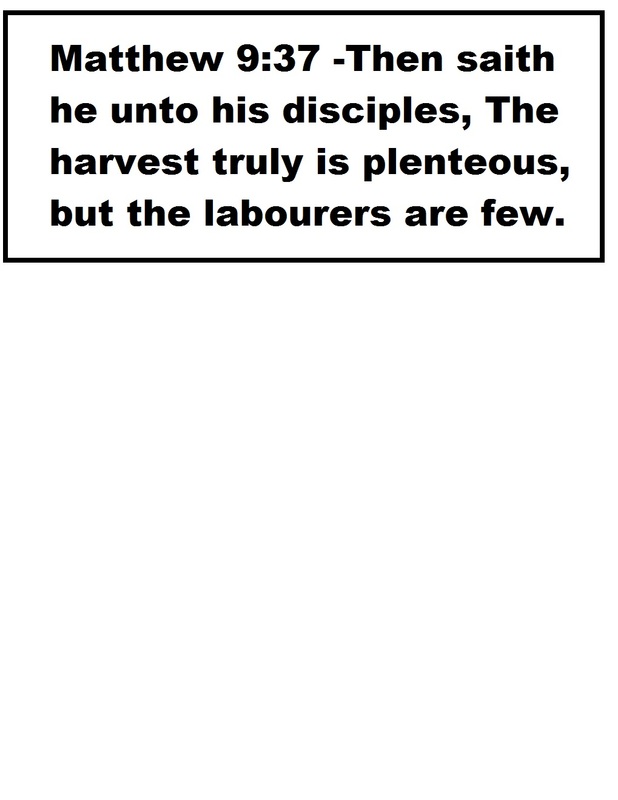 It has a scripture on the scarecrow about the harvest being plentiful but the laborers are few. Fill the wheelbarrow full of hay. Hide very small prizes in the hay. Have a time ready and give each child a couple of seconds to find a hidden prize. When time is up their turn is over. They can only grab one prize out of the hay. 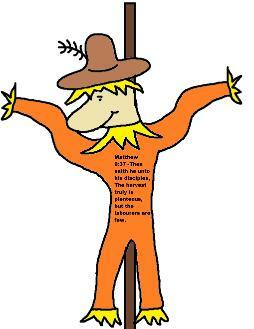 Buy a scarecrow pinata and tape this piece of paper to the front of the scarecrow's belly that has the scripture: Matthew 9:37 -Then saith he unto his disciples, The harvest truly is plenteous, but the labourers are few. Hay Bale & Scarecrow Bulletin Board Idea: Cover your bulletin board with black paper. 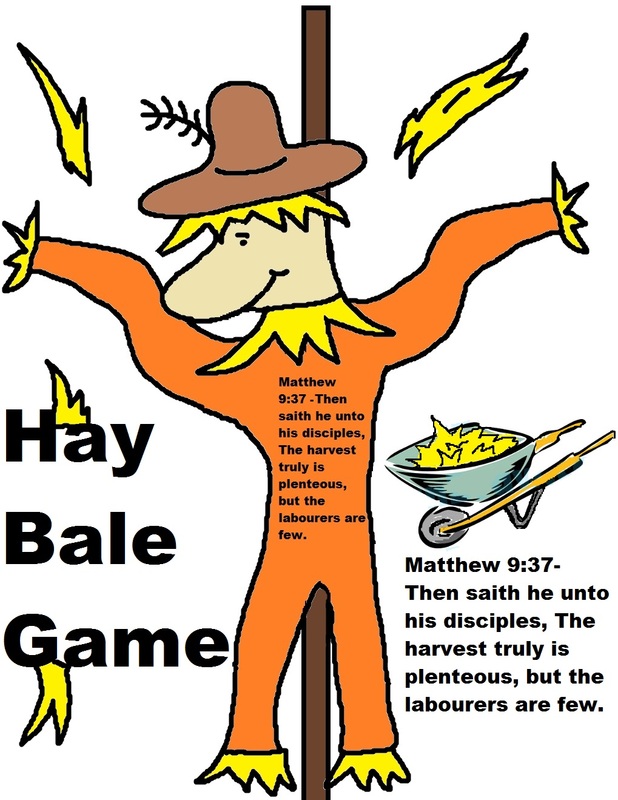 Print a bunch of the hay bales out and scarecrows with the scripture on it out. Cut them out and laminate them. Spell the words "Harvests Working For The Lord" with store bought bulletin board letters right in the middle of the bulletin board. Add the hay bales and scarecrows all over the board. Write the children's names on the hay bales if you want. You could take their pictures and place their face on top of the hay bale. They represent the children working for the Lord. Add some orange trim around the bulletin board. 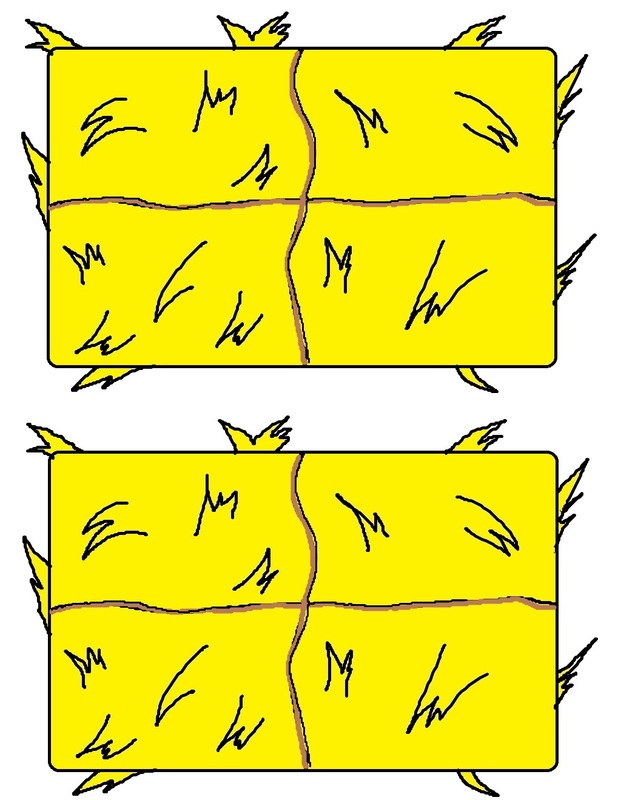 Cover your bulletin board with yellow paper. 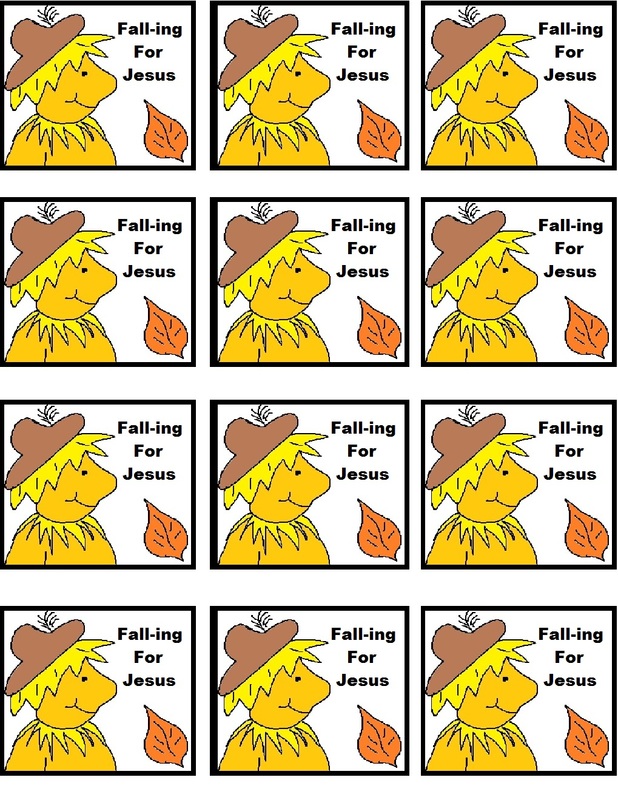 Spell out the words "FALL-ING FOR JESUS" in the middle of the board. Add a fall tree on each end of the bulletin board and cover the rest of the board in fall leaves. Add a fall leaves trim around the board. Cover the bulletin board in black or yellow. 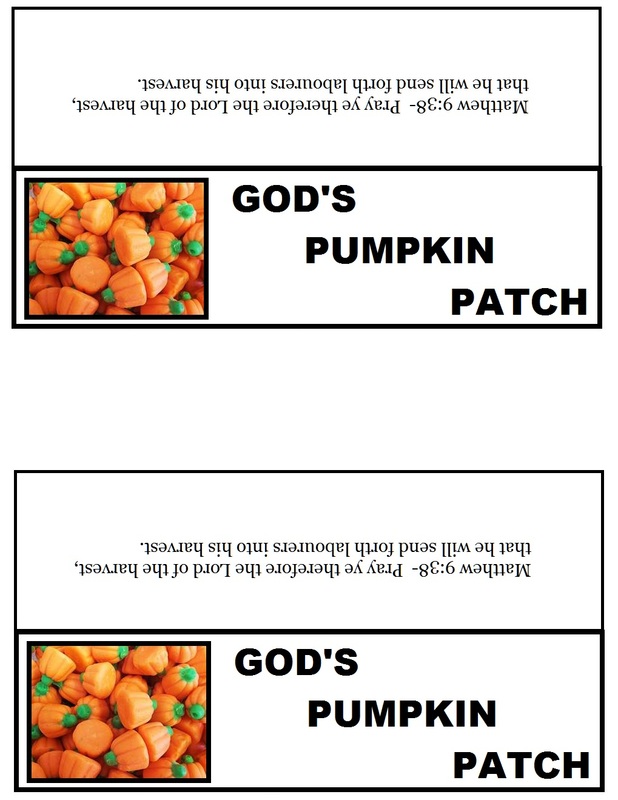 In the middle of the board spell out the words, "GOD"S PUMPKIN PATCH". Add pumpkins all over the board. If you want you could add a picture of each child's face to each pumpkin or you could just write their name on the pumpkin. Add pumpkin trim around the board. Cover the bulletin board in black paper. 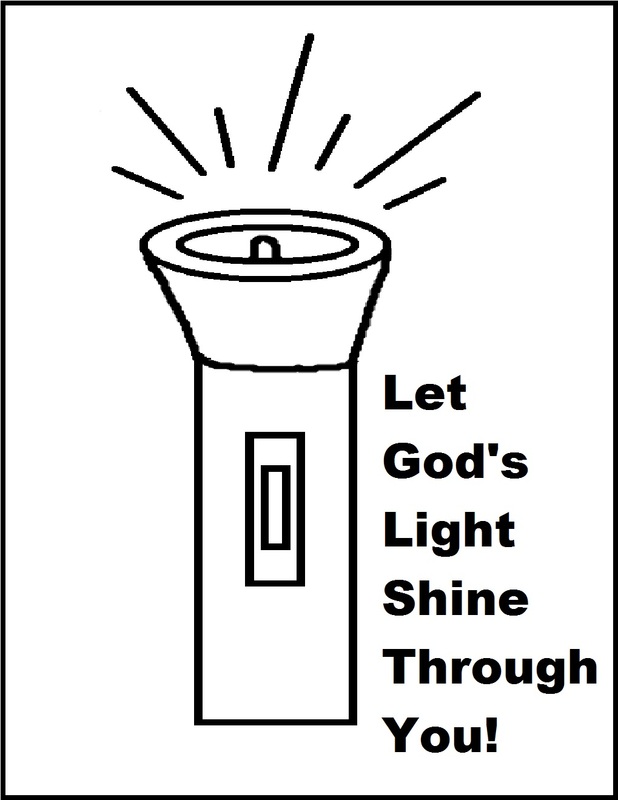 Print out this coloring page of a flashlight that has the words "Let God's Light Shine Through You!" on it. Let the kids color the picture. Then hang each picture that the children colored all over your board. Trim the bulletin board in orange. If you you have room you could spell out the words "LET GOD"S LIGHT SHINE" on the bulletin board somewhere if you have a really large board. If you don't have room for it then it will still look fine because they children will like that their artwork is on display. Apple and Cob Dip: Fill a large wide container with water and add your apples and corn on the cob to the bucket. Let the kids bob for the apple or the corn. Candy Apple Fun: Let kids make their very own one of kind decorated candy apple to eat. Give them an apple with a large popsicle stick and a plastic bowl. Set out sprinkles, sugar, brown sugar, nuts, candy corn, pretzels, chocolate chips or anything else that might sound good. Give them squeeze bottles of chocolate syrup and caramel syrup (that you pour over ice cream). Have the kids put the large popsicle stick in the apple. You may have to do this for them before you give it to them. We did this in class one time and we just did for them. Have them pour the syrup of their choice on the apple and then sprinkle what they want on it. The syrup will not really stick to the apple like real caramel will but this is just something easy and fun for them. The kids really had fun when they did this. Stuff The Scarecrow Game: Grab a pair of old jeans, an old long sleeve shirt and old pillow case. Decorate the pillow case ahead of time for his face. Use an old straw hat and have some hay handy. Let the kids race to see who can put a scarecrow together the fastest. The one with the quickest time wins. Give the child that wins a prize. 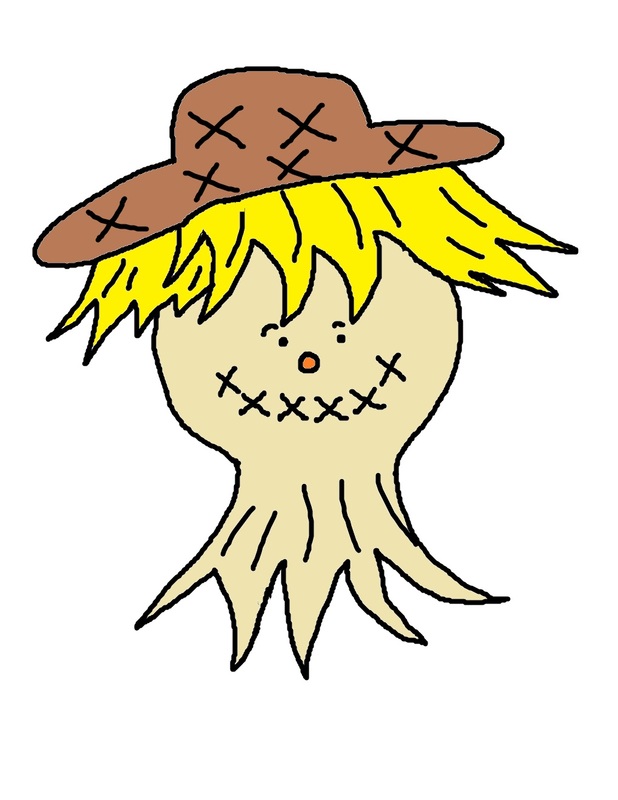 You could also just let the kids make the scarecrow for fun and let the kids do it however you wanted and then display it for the Fall Festival. Tape the harvest scripture across his stomach. Hang candy corn decorations from the ceiling. Make a giant Candy Corn Prop using a large cardboard and cut it out in the shape of a candy corn. Draw a black line in three spots so you can color in the candy corn with spray paint. Just cover the areas with paper or plastic when you are spraying. Spray the top white, the middle orange, and the last one yellow. Give the candy corn some eyes and a mouth. 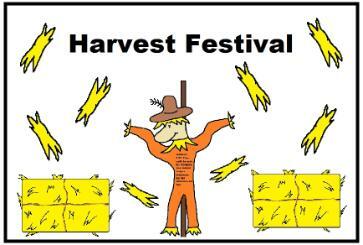 Write the words,"Harvest Festival" or "God's Harvesters", or "FALL-ing For God" or "Harvesting For Him". Cover tables with candy corn tablecloths. Hang orange streamers from the ceiling if you want. 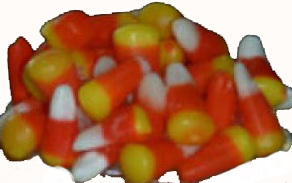 Buy candy corn harvest seed candy online for prizes. 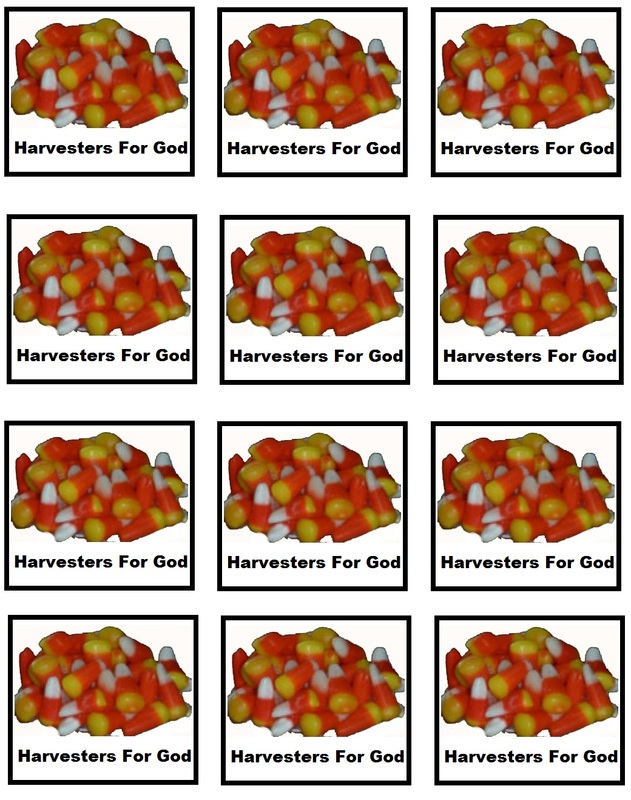 You could make up treat bags by buying brown lunch bags and taping a picture of this candy corn "Harvesters for God" square picture on the front. Fill the bag with something fun for them and fold it over and staple. 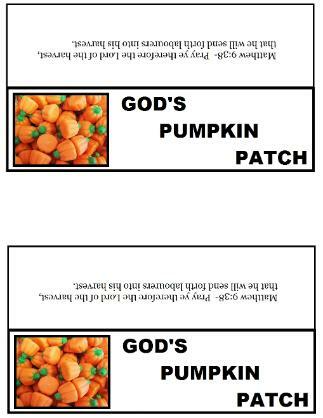 Or you could let the kids decorate their own bags by coloring a candy corn all over it and then writing the words "Harvesting For Him" on the front it. Make a Candy Corn Poster Board: by hot gluing either real candy corn or fake candy corn all over a black poster board. Write The Words, "Harvesting For Him" at the top. Hang up on a door. Candy Corn Cupcakes: Bake cupcakes and stick these candy corn cupcake toppers down in the cupcake. 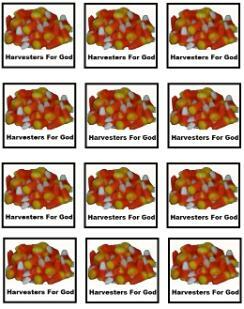 They say, "Harvesters For God" on the front of the candy corn picture. Take these for the Fall Festival for the kids to eat. 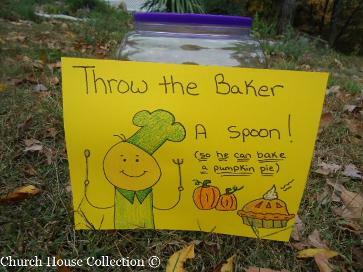 Candy Corn Spoon Race Game: Have the kids line up in two teams and lay one candy corn on each child's spoon. Have them race to the end and drop in a jar and run back. First team to finish first wins. Candy Corn Jar Guessing Game: Fill a glass jar full of candy corn and count them so you know how many are in the jar. Have the kids guess the number and the closest one wins the jar. 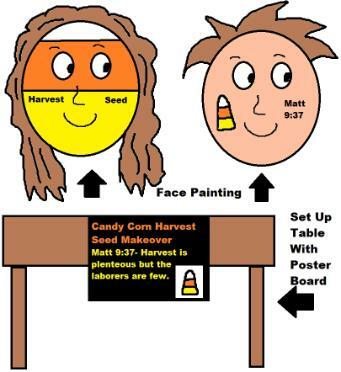 Candy Corn Harvest Seed Makeover Booth: Set up a small table in the corner and tape a poster board to the front of the table. 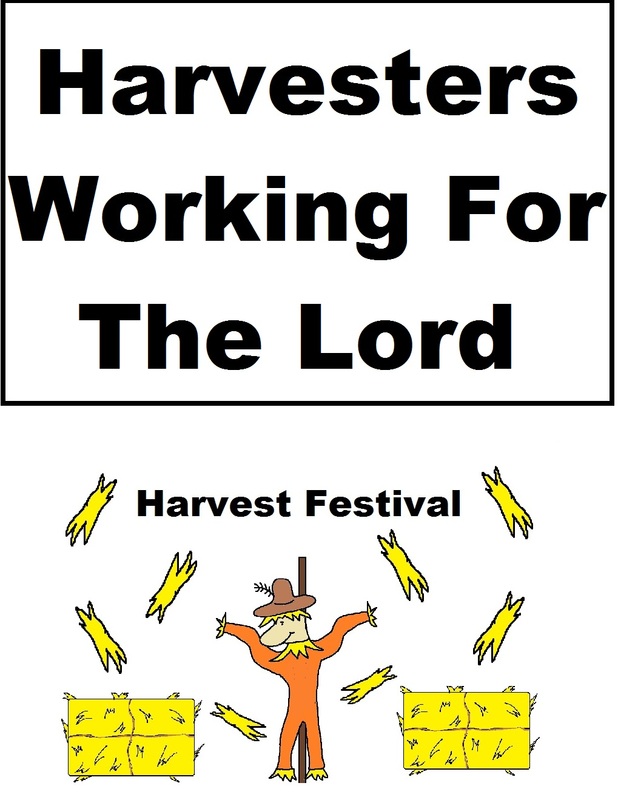 On the poster board write the word, "Candy Corn Harvest Seed Makeover" Matt 9:37-The Harvest is plenteous but the laborers are few. Put a picture of candy corn on the poster board in the lower corner. Paint the kids faces white, orange and yellow using thick horizontal lines. Or you could paint a small candy corn on side of their cheek and write the words Matt 9:37 or Harvest Seed on the other side. 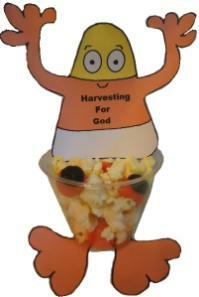 God's Pumpkin Patch Popcorn: Just pop some popcorn and add the pumpkin candy corn to the popcorn. Fill a small ziplock bag up with the concoction and staple our popcorn template to the top of the bag. 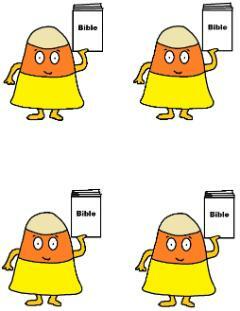 Candy Corn Tree- Print the candy corns holding their bible up template out. Laminate them. Punch hole in the top of candy corn and run a string through the top. Find a dead tree top with lots of branches and bring to your classroom. Tie the candy corns to the branches. 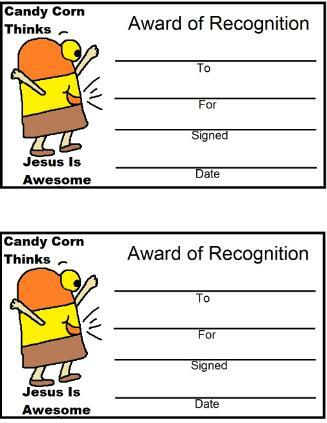 Write the child's name on each candy corn if you want. You could put a large sign at the bottom of the tree that says, "REMEMBER TO READ YOUR BIBLE". Back to Fall Lesson With Lots of stuff in it! Fall Festival Game Ideas- lots of ideas.